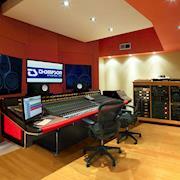 We are a state of the art multi-room Recording Studio located in SoHo, NYC. Our studios are designed to perfection by award winning Walters-Storyk Design Group and built from the ground up on floating foundation. We have one of the largest collection of vintage analog gear including an SSL 4000 E/G series console in the A room and a Vintage Neve Console in our B-Room both coupled with Pro Tools HDX system and tons of great plugins, offering the highest quality in both Analog and Digital. Our facilities are available for Production, Tracking, Mixing of Music for nearly any application, Scoring, Video Games, Voice Overs, Midi, Editing, Analog Tape Transfers and more. Our rooms are also available for Photo and or Video Shooting of Artists or Products. Every Room is equipped with HDTV LCD Screens that can receive signal from any room at any time. Ideal for Voice Overs or when Music synchronization to Image is required. We have a full-time staff of highly skilled technicians from 81series making sure that our equipment is running flawlessly. We also have in-house Producers, Engineers, Song Writers and Musicians available for hire. Please check our website www.thompsonstudiosnyc.com for more info or to schedule a visit in person.